This is the phrase ForAllThatWander & I have been saying to ourselves constantly over the last few days! As you will know if you’ve been reading either of our blogs over the last few weeks, we’ve spent the bank holiday weekend down in London which is why this post is so late. We both struggle with social anxiety so this was always going to be fun! Abby actually wrote a post called Surviving London: The Social Anxiety Sufferers Guide so be sure to check that out too. Abby has been to London more times than me so she became the responsible adult on this trip and organised everything. We stayed near Victoria station in a Premier Inn like usual and it was actually pretty central to everything we needed transport wise. The room was a bit smaller than we’re used to but it had air conditioning which was a life saver for a northern gal who isn’t used to the London heat! We normally eat breakfast at the local Weatherspoons on account of my eating disorder and Abby’s allergies (we’re soooo much fun to eat out with!) and this time it was a place called The Willow Walk. Now normally we’ll check out a place on TripAdvisor before we eat there, just in case, but we were that hungry when we landed we decided to just go as we’d never had a bad experience with a Weatherspoons before. Bit mistake. The food was disgusting! I ordered a jacket potato and Abby just ordered some chips as she didn’t know what else she wanted. Now if you eat at Weatherspoons you’ll know what I mean when I sat their chips have a certain taste to them as they’re home made. These were just plain old oven chips. And they weren’t even cooked through properly, one end was still solid. My jacket potato wasn’t much better, parts of it were undercooked and the cheese was a melted mess. Now I’m not willing to pay for something that I’m not happy with so I went up to the bar and complained. The guy didn’t seem to understand why I wasn’t happy but took it away and said he’d remake it. A few minutes later he came back with another tatie but this wasn’t much better. The cheese wasn’t a puddle this time but it still had clumps of uncooked bits so we just gave it up as a bad job, went off to the Sainsburys up the road from our hotel, bought some bread and snacks and called it a night. Lesson learnt- don’t go back there again. We considered the other one that was close to us but we did the smart thing this time and checked the reviews, found them to be bad too and decided we could live without it. We usually go to Weatherspoons for breakfast but after the fiasco on Friday we decided against it and, since I’d never had one, we opted to spend a little extra and have a premier inn all you can eat breakfast. Oh my days this is something I wish I could afford every time! I am a huge pancake fan, it’s my main period craving and definitely a comfort food favourite. Anyway I decided to try a bit of everything and I was happily in a food coma an hour later! We started off our day by catching a bus to Trafalgar Square. I’d never been there before and we wanted to keep away from the “traditional” tourist spots and go somewhere new(ish). There were lots of street performers and artists there and it was great to see, it made it feel like a festival and I loved it! I have a kind of phobia of things in masks though so this guy slightly freaked me out…still I loved the place and can’t wait to go back! After we’d looked around and got loads of Blog and Instagram pictures (priorities I know) we headed off to somewhere we’d both been looking forward to seeing- The Good Ship Benefit. Benefit cosmetics is something I will treat myself to every so often as they’re brilliant products but a bit too expensive for a students budget! I’d seen the ship all over their Instagram & Snapchat and really wanted see it for myself. Abby actually didn’t fully realise that the Good Ship Benefit would actually be a ship on the water….the plonker! I couldn’t stop laughing for at least 10 minutes when she realised!! I’ve been going on ships and boats with my grandad for as long as I can remember so I’ve got pretty good sea legs but Abby…well if Saturday was anything to judge by, hers need a little bit of work! We sat up on deck with a drink after looking around the ship and drooling over the new range of products on display. It was great to just sit and watch the traffic on the Theames, it’s a shame it’s only temporary and leaves at the end of the month- I’d have loved to have gone again the next time we’re down. After this we made our way up to the Queens Theater to do something that I’ve wanted to for so long- see Les Misérables live on stage! I wanted to be a stage actress for a very long time when I was a child; I grew up watching the local pantomime every year and taking part in every school play I could. But life and common sense got in the way and I didn’t go forward with it, my parents couldn’t have afforded lessons or even to take me to the local voluntary acting troop anyway. I had goosebumps the whole way through the performance, the acting and the singing was beyond words! It took every bit of self-control I had not to start singing along at the top of my lungs…and nearly failed on One Day More! Back in February I won an NUS (national union of students) Twitter competition. It was meant to be for Valentine’s Day; a £25 Pizza Express voucher and £20 Odeon voucher to take your significant other out on a date…I’m single. Happily so really. So I’ve not got round to using it- sitting in a restaurant eating a pizza on my own isn’t really my idea of fun! So it’s just been sat in my purse. When we came out of the theater we noticed a Pizza Express right in front of us so I decided to use my gift card and treat us both to some free food! I’ve never been to pizza express before so didn’t really know what to expect and I ended up being presently surprised, the food was lovely! I even tried something new which as anyone who has an eating disorder will know is something really difficult to do! I need to find myself a rich husband or win the lottery…the latter is a lot more likely to happen than the former! I’m not going to go into too much detail on this experience as this post is long enough as it is! I’ll probably be writing a separate post about what we did and everything but all I can say is you need to go!! Even if you’re not a big Harry Potter fan it’s a magical experience. And yes the pun is intended! It was the 15th anniversary of the philosophers stone so there were lots of new things to see, even for Abby. They had also just opened privet drive up so we could go inside and look around, which was great as it started raining the second we stepped outside so we ran in there for some cover…after the obligatory photo outside it of course! All in all it was an amazing experience and I had such a wonderful time- I could have stayed there all day. My bank balance want happy with my gift shop buying though! I bought a charm bracelet, a Slytherin postcard to frame and of course- a wand! And since everyone stereotypes Slytherins as the bad guys (including JKR herself no matter what she might say!) I decided I might as well get the wand I liked the look of most which was the Death Eaters one! Considering I was expecting them to be about £40 I was quite happy to pay £26 for one. Not sure where I’m going to put it as I’ve very little shelving or storage in my room but I’m sure I’ll find somewhere. And that’s about it really, we didn’t do anything on Monday as that’s when we were traveling back so didn’t have much time. You have to check in an hour before your coach leaves for Megabus apparently so we were stuck in the station for waaaaaay too long! Screaming children and obnoxious humans plus large crowds-let’s just say I’m surprised I didn’t have a panic attack…or get arrested! There was something else I bought but that’s going to feature in a later post so I’ll keep it to myself for now! 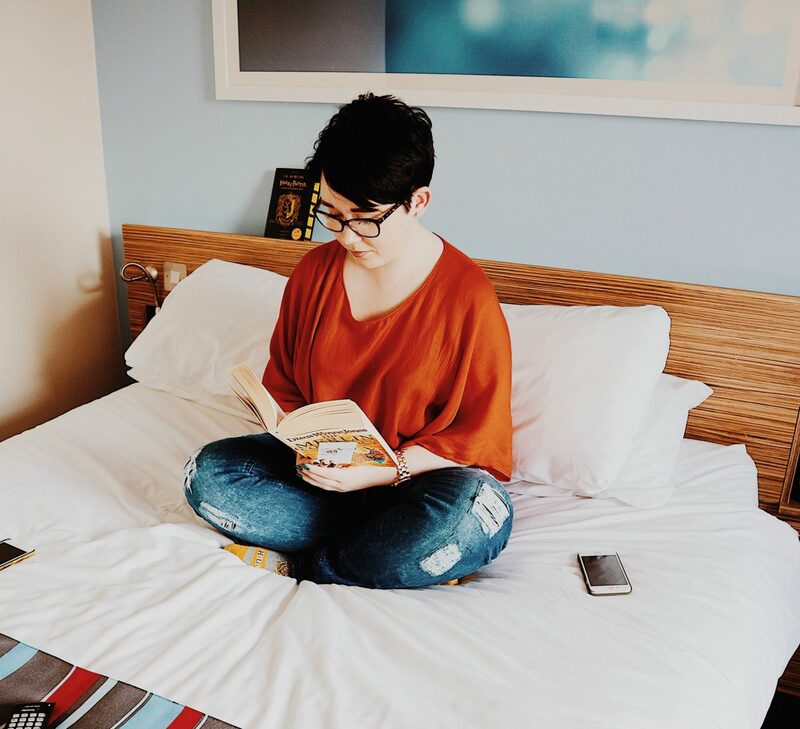 London has also given me lots of post inspiration for posts about travel and anxiety so if you’re interested in reading abut either of those subjects keep your eyes on my social media as they’ll be popping up soon! "Boots Haul & Real Techniques ﻿First Impressions "